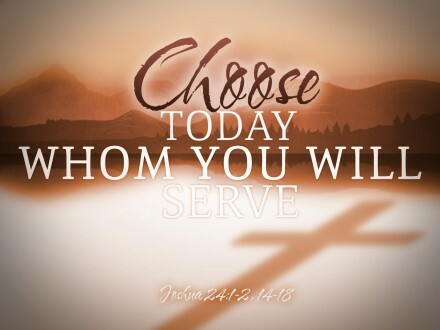 Choose this Day – Whom You Will Serve. I have never been so haunted by such a scripture as Joshua 24, and I will share a little more in detail here in a little bit, but the command in this passage has plagued my mind for going on a year now. I came across this passage earlier in the year during a quiet time, and then Brandon preached this passage during his Journey through the Word Series, and it also happened to be the theme of this year’s church camp. Everywhere I went this passage followed. God has a way of getting his message across one way or another, and I believe it is something we all need to hear. Joshua 24:14-15 Read/Pray Choose this Day – Whom you will serve. The Sunday School answer quickly comes to our minds, “of course we choose to serve God”, but have you weighed the consequences of serving God? We are so quick to say, “Yes, I will serve God”, without any thought of what is required of us in order to serve God. This is a revelation that really knocked me off my feet this week. The last month or so, has been a time of testing and trials. James chapter one has been a close friend of mine over the past few weeks. I have had my faith tested and tried in many ways unlike anything I have experienced before. I have had to take huge steps of faith, overcome fears, and conquer spiritual, physical, and mental pain. Many times it is so easy to just want to complain, bicker, and be strifeful when suffering pain; however when we realize that God never waste pain, but uses it for His purpose, it has a way of changing your perspective. 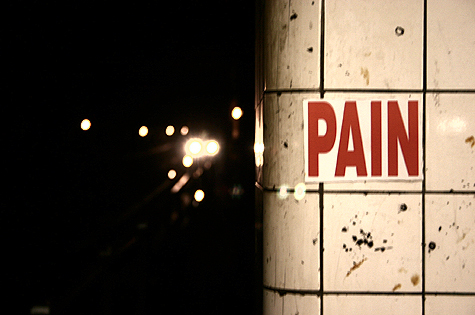 James tells us to consider this trial and pain joy. Happiness is an emotion while joy is a choice. No matter what you are experiencing right now, realize that God has a plan for that pain, a plan to mature and grow you. I will be posting some more pictures to go along with today soon! 7:00ish: The days are getting shorter. That must mean this journey is half-way over. I am kind of sad in many ways, but I look forward to returning to my beautiful family. Today went well. I led a small team of missionaries on a hike from Creve to Rochfort (which is pronounced Woshfort). It is a good 1-2 mile hike on rocky steep terrain. I didn’t think a couple of them were going to make it. I remember my first time, it is one tough trek, but after four days of it, it has become a breeze. We were w/out our Canadian friends today, so I had to pick up a lot of slack. At one point during the day a man collapsed in the crowd. Renita and Mona asked for a couple of guys to pick him up. I was first to get there, and what looked to be a 180lb man was probably only about 120lbs. I don’t know if it was adrenalin or what, but I picked him up single-handedly with out and trouble. Luckily it was not anything severe, mainly hunger and dehydration. He did not have a fever, and his blood pressure was great. Overall it was a good day. At the end of our clinics, I gave 5 kids a job to clean-up around the clinic. I worked them pretty good for about 30 minutes, and then paid them $1 U.S. which is a lot of money compared to Gourds (Haitian Dollars). The average Haitian makes around $2 a day. Anyways, these 5 Haitian became my little buddies. They followed me around everywhere until I had to go. Off in the truck we went, and suddenly one of them jumped on the back while it was moving. We had to stop and get him off, but it was kind of sad. I would have like to spent more time with them. Dinner tonight was awesome. Man, these Haitian women know how to cook. After dinner I consolidated a lot of my food and supplies so that I had only what I needed to get home. I gave the rest of my food and supplies to some teenage boys that I have become very close to. I also gave my two favorite workers a small gift. To Wilson I gave my favorite pair of sunglasses, and to Fred I gave a spotting scope. They all had great personalities, and were extremely helpful. We also had a mini-vet clinic after dinner here at the guest house, and we cared for 6 mules, 5 pigs, and a large horned cow. One of the mules pooped on me even though I was about 8-10 feet away. Don’t ask me how, projectile I guess. We also had one of the pigs go crazy on us. It was huge, and had to be controlled by three men. We finally treated it, and when it was finished it took off straight for a crowd of people. It was hilarious seeing all these people run. All week-long this same man (La Voy Ti) has been asking me for my shoes, unfortunately it is the only pair of tennis shoes I have, so I had to say no. Fortunately he came to the guest house tonight, and tonight we will be giving away men’s clothing and shoes. Hopefully he will be able to find him some. I also gave a special gift to one of my close friends Depson. Over the past few nights we have been listening to my battery operated MP3 player. I had one earphone and he had the other. He became fascinated by the music on there. I had many of my Christian favorites such as Toby Mac, Building 429, Casting Crowns, Third Day, Thousand Foot Crutch, and many other artist. I also had a few Bob Marley Classics: “Don’t Worry About a thing”, “Three little birds”, and a couple other relaxing hits. He knew the words to most of the Bob Marley songs. Bob Marley was not a Christian by any means, but he did believe in a higher power. The majority of his songs project peace and happiness, and that is something the people of Haiti are in desperate need of right now. So overall it had about 98% faith based songs & 2% miscellaneous. I gave him the MP3 along with enough batteries to last him a couple months. Tonight I also heard the great news that I am going to be preaching Sunday morning in Port Au Prince. I am extremely excited. I will preach anytime I get the chance. I am very honored to be able to preach at Creve & P.A.P. May God receive the glory. I also pray for many souls to be saved. During our medical clinic we saw between 700-800 patients, had many decisions, and 10 salvations. To God be the glory!! I am thinking about preaching out of Isaiah 6 “Here I Am Send Me”, but only the Lord knows certain. I thought I was finished preaching due to the number of preachers here, so I didn’t think twice about having to preach again, but at least this time I will have plenty of time to prepare. Last Sunday I didn’t find out I was preaching until Saturday evening. That was cutting it close. Anyways I better get to sermonizing. Later that evening: Tonight was much like the rest: praise and worship in the back of the truck followed by some good fellowship. I have developed a lot of respect for the men here serving on our team. Dr. John Ladd is one of my favorites. There is just something about him. He is so humble, and I truly see the love of Christ in him. Dr. Izzard is a genius. He has many great leadership qualities about him, and he desires to help as many people as he possibly can. Nurse Practitioner Jim Earl is a really funny guy, and he honestly loves what he does. He is great with his patients, and he really gets along good with all of the kids. Jim Brewer (O.J.) Is a very intelligent man aswell. He doesn’t seem to have a lot of patience, but he is a go getter. He is a man of character and perseverance. Veterinarian Dr. Paul is a kidder. He loves giving people a hard time, but he is a joy to be around. He is great with animals and children. (maybe because all 3 of them have something in common. j/k) Also, he is a mango eating machine. Professor Jim (Renita’s dad) we call him James because there are 3 Jims. He is an extremely intelligent man. He is a professor of agriculture, and a water treatment specialist. James is a hard character to define. He has imparted a lot of wisdom upon me, and I am grateful. Rancher Brodi Collins is one of the most likeable people I have ever met. I really enjoy the fellowship with him and his wife. They are a real joy to be around. Chaplin Bill Moore is one of the most genuine men I know. I can’t say enough about him, and there is no other like him. He has been an excellent mentor and friend. We share a lot of the same burdens when it comes to ministry such as worship and authenticity. Canadians Michael Barton (Mike) & Michael Porier: I will definitely have to keep in touch with these guys. They have completely changed my perception about Canada. They are true men of God. Dominican Republicans Omar and unfortunately I don’t remember the other guys name, but they seem like very humble men. I regret not getting to know them better, but due to language barriers we have not been able to connect. Hopefully over the next few days I will get to know them better. Overall the Mission Team and the People of Haiti are 5 star. I look forward to contacting my wife. I want to hear the voice of my wife and son. I love them so much, I hope they are safe and doing well. I do fear being contagious upon my arrival back home w/ my wife being pregnant, so I also pray for my own health for my families’ & mission’s sake. My son lost his first tooth in over a year last night, and he was so excited that the tooth fairy was going to come. We laughed about it, and then I told him I was going to stay up, and try to catch the tooth fairy in a jar. He laughed, and said “your silly dad, you can’t catch the tooth fairy he is invisible.” The next morning my son found four quarters under his pillow, and the first thing my son asked is did you catch him. I replied “no”. He said “I knew you couldn’t put him in a jar.” If only we had this kind of faith towards God. I sat in the pew last night, and I heard an awesome message from my pastor Brandon Cox titled “You Can’t Keep God In a Box” from 1 Samuel 4-7 He discussed the Boxes we have for God, and the Alternatives to Boxed Religion. He had multiple excellent points. I would encourage you to check out his blog at www.brandonacox.com He is going to be releasing sermon notes and his audio sermon soon! *I used a Connect the dot illustration to better complete the theme and thought process of this mess age. When it comes to decision making, sometimes we are not left with good options either way. The immediate results of your decision are not always a win-lose situation, sometimes it is a lose-lose situation. However we also know that God always provides for those who love Him. I didn’t say that He always provides a way out, but He does provide. Whether it is the strength to endure, the wisdom to overcome, or an escape route out, God always has a plan and a purpose. He never promised us life would be easy, but He did promise that He would be there every step of the way; or for the message theme every dot to dot. I want us to discover that by connecting with God and making spiritually mature decisions, we will draw that much closer to successful Christian living. Having an authentic genuine Spirit filled life is the key to an abundant, joyful, and prosperous journey through this thing we call life. The decision will make the difference. Provide aid (assistance) in times of trouble, trial, and temptation. So what about you? Have you connected the dots? Are you connecting with God? Are you trusting in Jesus Christ as your LORD and Savior.